Welcome to episode 11 of The CUInsight Experience podcast. Hosted by Randy Smith, co-founder and publisher of CUInsight.com. 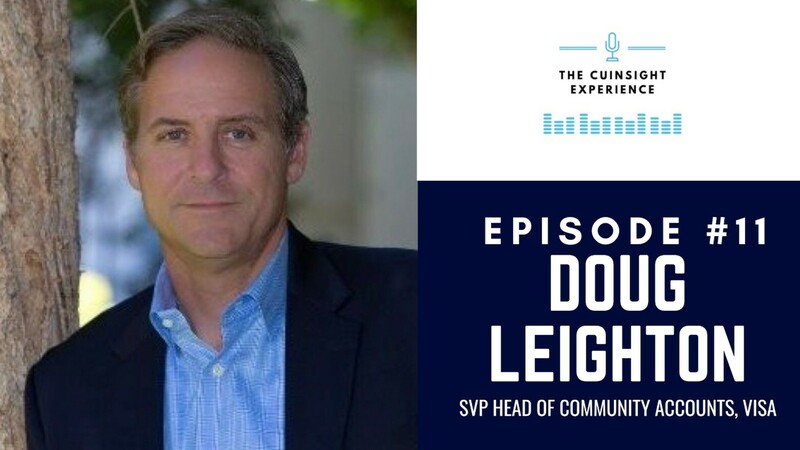 Today’s guest is Doug Leighton is the SVP of Community Accounts at Visa. You’ve probably seen him around the last few years, because he’s a big fan of the credit union community. And you’ll get to hear more from him today, because he’s the guest in this episode! Doug joined Visa after going to graduate school, and has now been with the company for 21 years. We’ll start off with talking about tap-to-pay, specifically how it functions as a bridge to other technologies such as mobile. It’s not a short-term bridge, though, Doug explains; cards will continue to be around for a long time. As you may have noticed, the US has lagged behind other countries with EMV and tap-to-pay. This has been the case for several reasons, particularly fraud concerns, as you’ll learn from Doug today. Fortunately, tap-to-pay alleviates fraud issues, and reduces the use of cash. 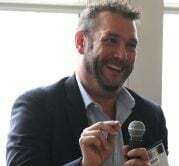 One of Doug’s passion projects involves mentoring young professionals in the payment space. In fact, I think you’ll hear in his voice how enthusiastic he is about this topic! In terms of credit unions, Visa is sponsoring Filene’s Center for War for Talent, as well as supporting the Crashers. He’ll dig into this topic, talking about the broader initiative of building the next generation of credit union leaders. We’ll chat about the challenges for credit unions in staying (or becoming) top of wallet, and how Visa is helping. Doug will dig into the significant changes that he expects to see in credit unions and other financial institutions in the foreseeable future. We’ll learn about the three traits that define his leadership style: empathy, mentoring and developing people, and saying “thank you.” Finally, and importantly, he’ll share his pro tips for a trip to Disney! Doug is “Riding to end AIDS“. Join him in this causes here. He’s riding a bike 545 miles, we can donate a couple bucks and cheer him on. Check out all the tools and resources for credit unions from VISA here. [00:03] – Welcome to episode 11 of the CUInsight Experience! Today’s guest is Doug Leighton. [02:48] – Does Doug see tap-to-pay as the bridge between the traditional card and mobile or wearables? [04:17] – Doug talks about why the US lags behind other countries in certain technologies. [06:47] – Does tap-to-pay create new security challenges, or does it help alleviate fraud? [07:50] – What does Doug see as the biggest current challenges for credit unions to stay (or become) top of wallet? [10:36] – We learn about how Visa is helping credit unions with the challenge of staying top of wallet. [11:56] – Randall shares an experience he had with one of his cards getting hacked. [13:29] – Is mentoring young professionals something that Doug is working on personally, or is it a movement that Visa is involved in too? [16:14] – Doug talks more about changing the guidelines of who Visa hires, and at what point in the process it starts. He also shares his enthusiasm for working with younger talent. [19:32] – We learn about the findings of the survey that Visa commissioned involving women and money (read about it at this link). [22:11] – Randall talks about his upcoming international credit union trip. [23:06] – How long has Doug been working in the payment space, and what inspired him to make Visa his career? [24:21] – Doug explains what it was that he learned about Visa that inspired him to want to work there. And has the inspiration changed over the past 21 years? [27:13] – With his work with credit unions and financial institutions, does Doug see a current belief that he thinks will significantly change in the foreseeable future? [30:39] – Doug talks about how he would classify his leadership style. [32:17] – We hear more about whether Doug has always had empathy, or whether it’s something that has blossomed over time. [33:58] – Is there something that Doug says so often that his team can finish his sentence? [35:01] – Doug talks about a common mistake that he sees. [35:57] – Does Doug have any memorable failures that ended up turning into a future success? [38:16] – Doug shares a piece of advice that he keeps going back to through his entire career. [39:11] – We learn about what Doug does when he runs into a wall, which goes back to his core value of empathy. [40:12] – Is there something that Doug does to keep his message fresh when he’s talking to people? [41:26] – Doug chats about what he does on a free day, his passions outside of work, and what work/life balance looks like for him. [42:42] – What pro tips does Doug have for someone who’s planning a trip to Disneyland? [44:08] – We move into the rapid-fire section of the show with the first question: does Doug remember the first time that he got into memorable trouble? [44:40] – Does Doug have any daily routines that he needs to do or his day will feel off? [45:21] – What’s the best album of all time? [46:08] – Is there a book that Doug has given away or recommended often? [48:09] – Who is the first person who comes to mind upon hearing the word “success”? [49:00] – Does Doug have any final requests or thoughts for listeners today? [50:41] – How can listeners reach Doug if they have more questions?